Along with concrete sawing, ABC Concrete Cutting, Inc began removing concrete years ago. We recently removed over 1.2 million pounds of concrete by using entirely electric tools. The use of electric tools eliminated carbon monoxide fumes and minimized the noise. 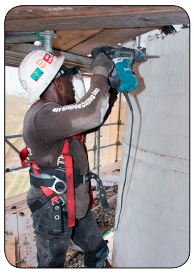 Sawing also eliminated any vibration normally associated with concrete removal. This was important because the Medical Center is a huge complex with nearly 5 million square feet of building, 17,000 employees and 1.5 million people a year using the facility. It was important to complete this work without disturbing ongoing operations. 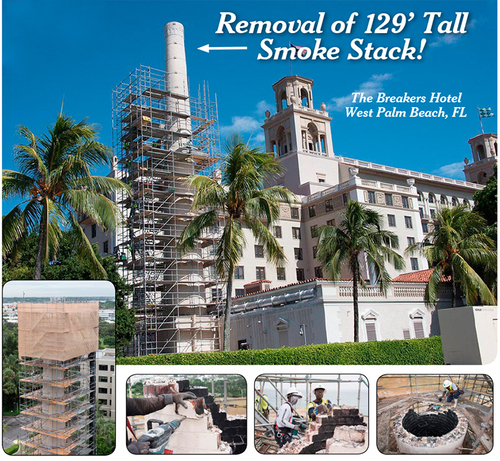 ABC Concrete Cutting Inc. was contracted by The Weitz Company to remove a smoke stack which was part of the original construction of the Breakers Hotel built in 1929 when the boilers were powered by coal. The smoke stack structure was 129’ tall, 16’ at the base and 10’ at the top, and was made of concrete and brick. The demolition project took a little less than two months to complete while in the midst of hurricane season. A wind meter was installed at the top of the scaffold to monitor wind strength. If winds reached above 50 miles an hour the project was shut down. If they reached over 80 miles an hour the scaffold would have to be disassembled....fortunately, the winds never got above 50 miles per hour during the operation. The steel bands were the tricky part! ABC Concrete Cutting installed ratchet straps above and below each steel band prior to cutting them, not knowing whether or not the wall would come apart and collapse the structure after cutting the bands. This was especially critical due to the fact an adjacent building was in use during the entire process. Call today with your concrete problem!